Hi, guys! I know it has been a long time since I shared a card I made with you. Truth is, I haven't been making any since I was in the hospital. This week I was finally in my stamp room making cards again. The card I am sharing today I made for my dear friend Amy who celebrated her 50th birthday (and I missed it!). 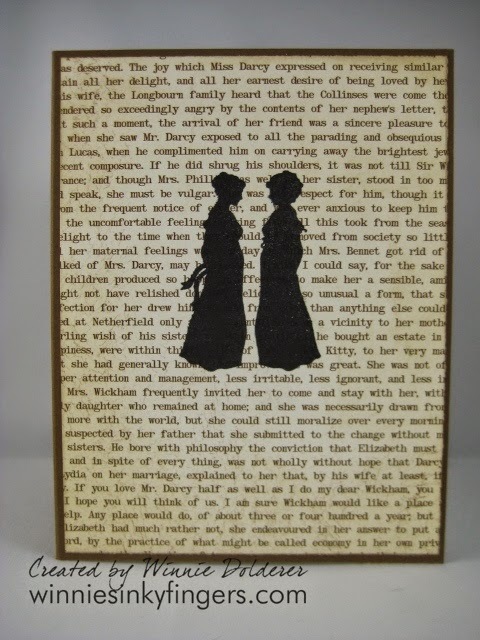 Amy is one of the ladies in the Jane Austen group I mention from time to time. What better way to say Happy Birthday to another Jane lover than with a Jane card! When I gave my friend her birthday gift, I made sure to include a vial of ink that is called Jane Austen. It is a lovely dark green shade. It is great to be back on my blog. I look forward to visiting with you as well. You don't realize how much you love your blog until you don't get time to work on it! I thought I would share a photo my husband snapped today. We have been having a snowy/icy and cold winter here. He found my garden sign poking out from the snow! I have been itching to get outside and after this winter, I will have PLENTY of work to do to get it ready for Spring! Glad to see you back and better Winnie! A beautiful creation and perfect for your friend who I'm sure will absolutely love this! I'm so happy that you are on the mend, especially enough to make this great birthday card. 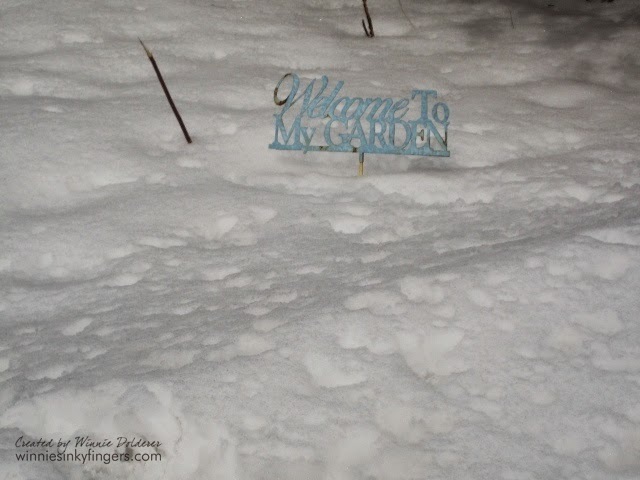 I sympathize with you and the poor little garden sign poking up through the snow...we had about 6 inches fall yesterday, and while I love it (for one day only), I'm ready for spring and for the green to replace all the WHITE!. Welcome back! Glad to see that you are back in your craft room and sharing this lovely card. I do love the silhouette look. O M G ! I hope you don't have too much snow to get rid of. We've been having cold weather here, but lucky no white stuff.